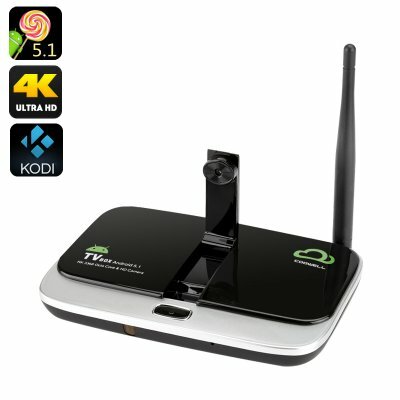 Successfully Added 4K Android TV Box - RK3368 CPU, 2GB RAM, 2MP Camera, 2.4GHz + 5GHz 802.11ac Wi-Fi, Kodi, Android 5.1, Quad-Core Mail-T6X series to your Shopping Cart. The V4 smart Android TV box is a great way to turn your TV or monitor into a multimedia centre. With the V4 TV box you can enjoy music, videos, games and even make Skype calls direct form your TV thanks to it built in camera. With a Rockchip3368 octa core cortex A53 CPU running alongside 2GB of RAM you get an astonishingly fast performance and the Quad-Core Mail-T6X series found in this chipset is a cut above the competition when it comes to 3D performance. So if you're looking for a TV box that can deliver a consistently smooth performance and maintain a solid frame rate then the V4 with its 3D support is great contender. Sporting a built in 2MP camera the TV box is great for video chats allowing you to Skype friends and family and enjoy free VoIP calls to anywhere in the world by just adding a simple Bluetooth mic or headset. Now rather than paying to make calls on the phone you can save money with friends and family all chatting online. Thanks to 2.4Ghz and 5Ghz Wi-Fi connectivity as well as the newer 802.11ac you can enjoy faster wireless speeds when connecting to your home router. Capable of maxing out at a whopping 1.3Gbits per second this Wi-Fi standard is exactly what you need for seamless downloading of HD content and ensure your smart TV box is ready to take advantage of the latest wireless routers. The Kodi media player comes already installed on the V4 TV box so you have instant access to a wealth of channels granting free access to the latest shows, sports and movies. With Android 5.1 running the show you will have an intuitive user interface and can cast the screen of your Smartphone or tablet direct to the TV box via Miracast, DLNA or Airplay. Connect memory pens or micro SD cards to boost the 16GB of built in storage and with USB and Bluetooth 4.0 it's easy to connect a wide range of peripherals while stunning audio output is available with the SPDIF port. With all this and more the V4 Android TV box is able to turn any HDMI screen into a future proof smart TV and comes with a 12 months warranty, brought to you by the leader in electronic devices as well as wholesale Android TV Boxes..